Be gloriously soaked by an overhead mixer shower or warm up under a self-heating electric shower. We have a wide range of showers to cover every feature from thermostatic mixer controls to power showers. Browse every style from traditional to contemporary, and every accessory from shower heads and handsets, to taps and valves. Coordinate your chosen shower with a chic shower screen for the ultimate experience. An electric shower uses cold water and, like a kettle, heats the water to a suitable temperature quickly. These showers only require cold water and electricity to function, which makes them ideal if you can't use hot water from your heating system. A mixer shower needs a supply of both cold and hot water as it combines the two to get the right temperature. Mixer taps can work at a higher pressure than electric showers because they don’t have to heat the water within the unit – instead, they take hot water straight from your system. Thermostatic showers have a valve that keeps its water temperature constant. In a standard mixer shower, if the cold water pressure drops suddenly, you will get a shock when the water temperature increases abruptly. A thermostatic valve uses a heat sensitive element that automatically decreases the flow of hot water if the cold water pressure drops to keep temperatures consistent. 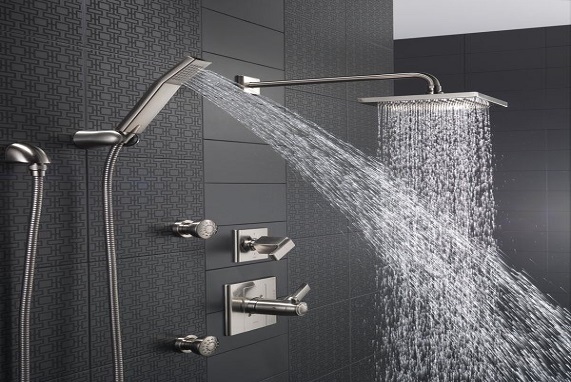 Power showers are essentially mixer showers that use a pump to boost water pressure. If you are already happy with the water pressure in your home, then you may not need a power shower. Although, if you have low water pressure, or just like a strong shower, then a separate shower pump for a mixer unit or power shower would be a worthwhile investment. Not everyone showers the same. Some people prefer to wake up and have a refreshing massage experience while others find evening showers to be more relaxing and prepare them for a good night's sleep. That is why we have designed showers with different functions to suit your different needs. QM Nami Center Drain Satin Finish 5 3/4"x 5 3/4"
QM Kai Center Drain Satin Finish 5 3/4"x 5 3/4"
Qm Delta Center Drain Satin Finish 5 3/4"x 5 3/4"
QM Mist Center Drain Satin Finish 5 3/4"x 5 3/4"
Linear Infinity Shower Drain 24"
Qm Delta Center Drain Polished Finish 5 3/4"x 5 3/4"